SUE Solution’s team members successfully completed the utility asset evaluation and management for this UDOT roadway extension project. 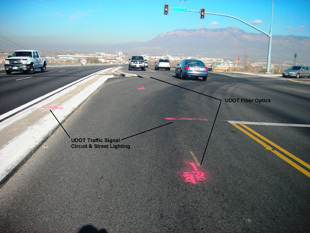 The original project scope included both SUE Quality Levels ‘A’ and ‘B’ for the intersections of SR-108 (Midland Dr) and 3600 South, and SR-126 (1900 West) and Hinckley Drive in Roy. As part of the Level ‘B’ designating process, SUE Solutions identified 13 utility owners between the two intersections, and coordinated efforts with both the Utility Owners and Blue Stakes, ensuring a comprehensive and accurate account of the utility facilities. The utility data collected was then integrated into previously developed utility plans. Approximately 5,000 feet of utilities were designated and surveyed. 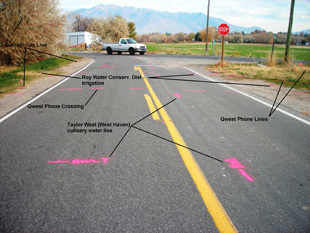 The final deliverable to UDOT included a thorough final report which outlined SUE Solution’s findings accompanied by comprehensive utility mapping, photographic documentation, and survey data.